The horrific events in Boston last week shone a spotlight, once again, on the fragility of our cellular infrastructure. Following the twin bombings the cellular networks almost immediately collapsed. While the Associated Press originally reported authorities had “turned off” the cellular network to prevent further explosions, it seems the surge of call volumes was the real cause of the collapse. “The culprit is usually congestion. During a disaster, call volumes spike and overwhelm the over-subscribed capacity of wireless carriers’ networks. On September 11, 2001, fewer than 1 in 20 mobile phone calls in New York City was connected. The same thing happened after the August 2011 earthquake that shook the East Coast. And on Monday, in Boston.” (Anthony Townsend of Atlantic Cities). When the cellular infrastructure fails the only remaining means of communications are the tried-and-true Public Switched Telephone Network (PSTN) or the Internet, both wired solutions. Indeed, in Boston, local businesses opened their Wi-Fi hot spots to the public to allow communication. However, even Wi-Fi networks are vulnerable to power systems outages as was made apparent during Hurricane Sandy and the 2003 New York City blackout. 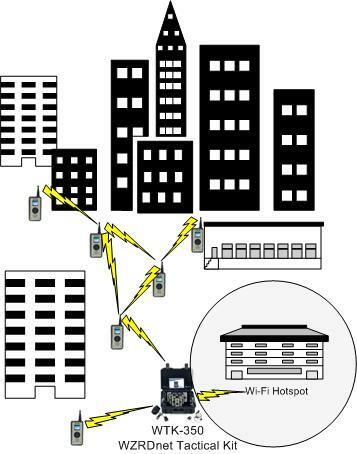 The only way to ensure communications is to deploy a standalone wireless local area network like the WZRDnet low-power mesh network. WZRDnet is a true “infrastructure-less” network that does depend on cellular towers, base stations or satellites. WZRDnet handsets can communicate in point-to-point or broadcast fashion via voice, data, text message or GPS without ANY support from external equipment. As opposed to ruggedized portable phones, which must be in range of a functional cellular node, WZRDnet handsets form their own network. If, a satellite terminal or other network is available (e.g., PSTN, VOIP), the WZRDnet Gateway can be utilized to extend the users’ connection to any desired remote party. 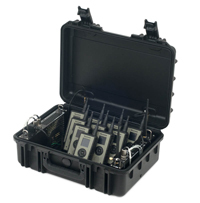 The WZRDnet Tactical Kit is the ideal solution for disaster communications. It contains, in one man-transportable case, a number of mesh handsets which allow voice, data and text messages. The Kit also includes a Gateway which can connect handset to any user on a VOIP network or the PSTN. The Kit can be held in storage and, when needed, quickly dispatched to the area of operation. Following along the success of the WZRDnet Tactical Kit, TELEGRID is proud to announce the release of two new versions of its mesh networking kits the WTK-350 PRO and the WTK-350 LT.
WTK-350 XL: The current version of the kit includes all the equipment needed for tactical or first responder operations including 10 handsets, accessories, a Gateway and an AC/DC Converter. The case includes a rear signal entry to allow open and closed operation. It also includes a gang charger to allow charging of all ten units inside the case. WTK-350 PRO: Designed for commercial applications including oil & gas exploration, site security and remote construction. 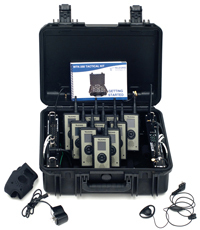 This kit includes 10 mesh handsets, a Gateway to external networks and an AC/DC Converter. WTK-350 LT: Built for Humanitarian operations and smaller networks the WZRDnet Tactical Kit LT provides 5 mesh handsets, a Gateway and accepts AC power. 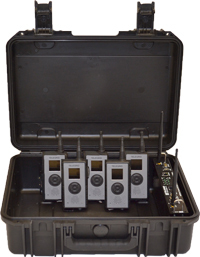 The WTK-350 LT is an ideal candidate for integration into larger rapid deployment kits. To learn more about our range of WZRDnet Tactical Kits click here. TELEGRID invites you to the New Jersey Emergency Preparedness Association on May 8th and 9th at the Tropicana Casino & Resort in Atlantic City, New Jersey. The NJEPA serves New Jersey’s Emergency Managers and private partners in the emergency management community. The NJEPA presents timely and informative, up to date preparedness information and training to better prepare Emergency Managers. TELEGRID engineers will be on site to demonstrate the WZRDnet low-power wireless mesh network.